The Death of Socrates, by Jacques-Louis David (1787) depicts the philosopher Socrates carrying out his own execution. The word philosophy comes from the ancient Greek words philo-, to love or to befriend, and, -sophia, to be wise. It can be construed then either as the love of wisdom or the wisdom of love. The answer to the question "what is philosophy? ", has almost as many varieties as there are philosophers. In the contemporary English-speaking world it is often used implicitly to refer only to analytic philosophy and, on the other hand, in non-English speaking countries, it often refers implicitly only to continental philosophy. This modern-day division of analytic and continental philosophy (confined largely to academia) is problematic for understanding the current use of the word,philosophy since both of these two areas talk of philosophy in general but are often only referring to that school. The easiest clue to indicate which of these philosophies is being referred to by the word philosophy is to note the language used. But modern usage of the term is much broader than this rather academic division. Since the ancient Greeks discovered many of the ideas of logic, math, and geometry that are often associated with classical ideas of philosophy, it behooves us to ask what they meant by it. Human curiosity and the compulsion to ask questions has always existed. But the ancient Greeks were perhaps the first to explicitly ask: Is the world (of which we are also a part) intelligible? And if so, how? They answered in the affirmative through the human capacity to reason. Their view of reason rested in the creation of concepts using the deductive method operating on the data provided by the senses as its basic material, and then reasoning further from this conceptual base. They invented the concept of philosophy to designate the whole endeavor of making sense of all aspects of existence. As a consequence the ancient Greek philosophers identified philosophy with rationalism. But rationalism is only one possible answer to the question of intelligibility. Throughout the history of human thought since the ancient Greeks many thinkers have argued that aspects of reality are not intelligible in a strictly rational sense. A range of answers to philosophical questions were subsequently proposed that fall somewhere on a spectrum between the two poles of rational and non-rational. As a consequence modern usage no longer limits the term philosophy to the original ancient Greek idea but has broadened the concept as covering the entire spectrum of thought on these questions. Mankind only began to philosophise, Aristotle considered, after all of the normal necessities of life had been achieved. For him then it is a non-practical kind of leisure activity. However, Socrates before him considered it to be the most valuable and, in that sense, most practical activity. Philosophy as a concept and a subject encompases all of knowledge and all that can be known including the means by which such knowledge can be acquired. The ancient Greeks organized the subject into five basic categories: metaphysics, epistemology, ethics, politics and aesthetics. This organization of the subject is still largely in use today and can be profitably used regardless of where one's answers to specific philosophical questions lie. Metaphysics is concerned with the nature of existence in the most fundamental sense. It attempts to answer the question as to what are the most fundamental attributes that all existing things share, if any, as well as fundamental questions concerning how they relate to one another. Epistemology is concerned with the nature of knowledge and how man can know things. As such certain aspects of the functioning of man's mind is included -- his rational faculty (particularly his conceptual capacity) and how it functions as well as his emotional nature. Ethics is concerned with the nature of values and in particular how this concept applies to man and his relationship to the external world and to other men. Politics is concerned with the behaviour of men toward one another in the social context. Hence the first question of politics as a philosophical subject might be: how should men deal with one another in such a social context? Thus it can be seen that politics is really a sub-category of ethics since ethical criteria must be used in order to answer its questions. Aesthetics is concerned with man's artistic creations. It also involves choice, i.e., value criteria and as such can also be viewed as a sub-category of ethics. There are a number of broad approaches to the subject as a whole which vary according to the traditions of people all over the world. One notable approach is that of Western philosophy, a school of thought originated by the Greeks and developed in the West (discussed above). Eastern philosophy is considered its counterpart since subjective non-rational criteria are largely used to evaluate and resolve issues. The methodology of philosophy is itself debated within the field of metaphilosophy and epistemology. The term philosophy comes from the Greek word Φιλοσοφία ( philo- sophia), which means "love of wisdom." If one were to ask ancient Greek philosophers for the meaning of " wisdom", their answers would have dwelt on virtue, the quest for genuine knowledge, and the eradication of false opinions. Many of Plato's complete philosophical dialogues have been passed down to us, and Plato is often considered to be one of the first great philosophers, along with his teacher Socrates, and his pupil Aristotle. For them, philosophy was seen as a questioning of first principles, and a search for methods to obtain true first principles. They studied the deductive method of logic, mathematics and geometry, and the inductive method of natural philosophy, biology, and astronomy. Plato introduced the Intelligible method, and the theory of the divided line, as well as the allegory of the cave, as a basic introduction to the philosophical way of life that he taught. Plato and Socrates would have defined philosophy very differently than we do today. Now the term "philosophy" is notoriously difficult to define (see definition of philosophy) because of the diverse fields of study to which it has been popularly applied, similar to the various schools of ancient Rome, or the schools that competed with Plato's Academy. The Penguin Dictionary of Philosophy defines it as the study of "the most fundamental and general concepts and principles involved in thought, action, and reality". It goes on to observe that philosophy differs from science in that philosophy's questions cannot be answered empirically, and from religion in that philosophy allows no place for faith or revelation. However, these points are called into question by the Oxford Dictionary of Philosophy, which states: "the late 20th-century spirit of the subject [...] prefers to see philosophical reflection as continuous with the best practice of any field of intellectual enquiry" . Indeed, many of the speculations of early philosophers in the field of natural philosophy, geometry, mathematics, logic, and astronomy eventually formed the basis for the modern scientific method and several kinds of modern scientific explanations. There is no universal agreement about which subjects are the main branches of philosophy. In The Story of Philosophy, Will Durant lists logic, aesthetics, ethics, politics, and metaphysics. He is clearly following the Greek structure with the exception of logic. The Greeks viewed logic as only one aspect of epistemology. Issues such as the basis of logic (i.e., the self-evident axioms on which logic rests), the validity of the senses, the issue of free will, the nature of emotions, the nature of the subjective and the objective and others are also included. Nevertheless, there are many places where these subjects overlap (particularly in metaphysics and epistemology), and there are many philosophical ideas that cannot be placed neatly into only one of these categories. Outside these five broad categories are other areas of philosophical inquiry such as religion or theology. The history of philosophy is often divided into three periods: Ancient philosophy, Medieval philosophy, and Modern philosophy. Eastern thought has been, for most of its history, independent of ancient and medieval philosophy. Some philosophers have argued that human civilization has passed into a new, " post-modern" period. Others believe that there is a distinction between "Modern" philosophy and Contemporary philosophy, but there is great disagreement about the content of this difference. It is important to note that ancient Greek and Roman philosophers never thought of themselves as "Western" philosophers, and it would be historically inaccurate to claim this. Many classical Greek texts were actually preserved in the Middle East, and forgotten and lost in the specific areas of Italy and Greece until the Renaissance. In this way, an alternative understanding of the history of philosophy is in terms of such trans-periodic traditions as Aristotelianism. Ancient Greek philosophy may be divided into the pre-Socratic period, the Socratic period, and the post-Aristotelian period. The pre-Socratic period was characterized by metaphysical speculation, often preserved in the form of grand, sweeping statements, such as "All is fire", or "All changes". Important pre-Socratic philosophers include Thales, Anaximander, Anaximenes, Democritus, Parmenides, and Heraclitus. The Socratic period is named in honour of the most recognizable figure in Western philosophy, Socrates, who, along with his pupil Plato, revolutionized philosophy through the use of the Socratic method, which developed the very general philosophical methods of definition, analysis, and synthesis. While Socrates wrote nothing himself, his influence as a "skeptic" survives through Plato's works. Plato's writings are often considered basic texts in philosophy as they defined the fundamental issues of philosophy for future generations. These issues and others were taken up by Aristotle, who studied at Plato's school, the Academy, and who often disagreed with what Plato had written. The subsequent period ushered in such philosophers as Euclid, Epicurus, Chrysippus, Hipparchia the Cynic, Pyrrho, and Sextus Empiricus. The medieval period of philosophy came with the collapse of Roman civilization and the dawn of Christianity, Islam, and rabbinic Judaism. The medieval period brought Christian scholastic philosophy, with writers such as Augustine of Hippo, Boethius, Anselm, Robert Grosseteste, Albertus Magnus, Roger Bacon, Bonaventure, Thomas Aquinas, John Duns Scotus, William of Ockham, Nicholas of Cusa, and Francisco Suárez. A female Christian philosopher of the period was a student of Abelard named Heloïse. The philosophers in the scholastic Christian tradition and philosophers in the other major Abrahamic religions (such as the Jewish philosophers Saadia Gaon and Maimonides, and the Muslim philosophers Avicenna, Al-Ghazali, and Averroes) were each aware of the others' works. These religious traditions took on questions about the relation of man to God. The philosophy of this period is characterized by analysis of the nature and properties of God; the metaphysics involving substance, essences and accidents (that is, qualities that are respectively essential to substances possessing them or merely happening to be possessed by them), form, and divisibility; and logic and the philosophy of language. Many of these philosophers took as their starting point the theories of Plato or Aristotle. Others, however, such as Tertullian, rejected Greek philosophy as antithetical to revelation and faith. Modern philosophy is generally considered to begin with the work of René Descartes. His work was greatly influenced by questioning from his correspondences with other philosophers. For example, the prodding of Pierre Gassendi and Princess Elizabeth of Bohemia obliged Descartes to try to formulate more cogent replies to the mind-body problem. Medieval philosophy had been concerned primarily with argument from authority, and the analysis of ancient texts using Aristotelian logic. The Renaissance saw an outpouring of new ideas that questioned authority. Roger Bacon (1214–1294?) was one of the first writers to advocate putting authority to the test of experiment and reason. Niccolò Machiavelli (1469–1527) challenged conventional ideas about morality. Francis Bacon (1561–1626) wrote in favour of the methods of science in philosophical discovery. The late modern period in philosophy, beginning in the late 19th century and lasting to the 1950s, was marked by a developing schism between the "Continental" tradition and the "Analytic" tradition associated with many English-speaking countries. What underlies the analytic tradition, especially the early analytic tradition, is the view (originally defended by Ockham) that much philosophical error arises from misunderstandings generated by language. According to some analytic philosophers, the true meaning of ordinary sentences is "concealed by their grammatical form", and we must translate them into their true form (understood as their logical form) in order to clarify them. The difficulty, so far unresolved, is to determine what the correct logical form must be. Some philosophers (beginning with Frege and Bertrand Russell) have argued that first-order logic shows us the true logical form of ordinary sentences. Other analytic philosophers, such as the late Wittgenstein, rejected the idea of logical form; and this issue of logical form figured prominently in early analytic philosophy. These debates over logical form are no longer as central to analytic philosophy as they used to be, and analytic philosophy now tends to address the full range of philosophical problems with all available philosophical methods. Today analytic philosophy's essence lies more in a style of writing and argumentation (that is, it aims to be clear and rigorous) than in its subject matter or ideas. An emphasis on carefully analyzing language to reveal philosophical errors still remains; but the “analysis” that figures in the name “analytic philosophy” is now just as likely to refer to the analysis of ideas, arguments, social institutions, and presuppositions. "Continental" philosophy is most closely identified with the phenomenological movement inaugurated by Edmund Husserl and the various reactions to and modifications of Husserl's work. Phenomenology is primarily a method of investigation. As Husserl conceived it, to investigate phenomenologically is to examine the contents of conscious experience while bracketing all of the assumptions we ordinarily make concerning the existence of objects in the world. He believed that we could arrive at certain knowledge by deducing the necessary features of our conscious experience. Perhaps the most important such feature deduced by Husserl was called intentionality, which denotes the character of consciousness by which it is always directed at some object or other. The phenomenological method is an important alternative to the way that analytic philosophy typically proceeds. Instead of taking linguistic data as the starting point and linguistic analysis as the primary method of philosophy, phenomenology takes conscious experience as the starting point and the detailed analysis of such experience – that is, "phenomenological analysis" – as its method. Some important figures in the analytic tradition such as Wilfrid Sellars and Hector-Neri Castaneda have argued that linguistic analysis is actually a kind of phenomenological investigation because it appeals to our experience as language users to answer philosophical questions. In effect, they have argued that analytic philosophy is but one kind of phenomenology, the implication being that analytic philosophy can ignore the tradition that commences with phenomenology only to its detriment. While Husserl placed great emphasis on consciousness and took up an idealist position motivated largely by a firm distinction between a conscious ego and its objects, the subject-object distinction was deeply critiqued by Husserl's student, Martin Heidegger. Heidegger's 1927 book Being and Time was not only a critique of Husserl, but of a way of thinking that he believed infected the entire Western philosophical tradition of which Husserl was the latest expression. Arguably, Being and Time was the single most revolutionary work of twentieth century philosophy. Though Heidegger radically revised phenomenology, he still considered himself a phenomenologist. With him, phenomenology became existential phenomenology, which focused on producing a "hermeneutics of facticity" – an interpretation of the human condition as lived by real human beings. Heidegger was followed in this effort most famously by Jean-Paul Sartre in his book Being and Nothingness, which carried Heidegger's analysis further and applied it to concrete situations. Maurice Merleau-Ponty critiqued Sartre while still continuing on the path marked by Heidegger's emphasis on our practical engagement with the world as opposed to the Husserlian focus on explicit conscious awareness. The hermeneutical strand of Heidegger's work was developed by Hans-Georg Gadamer in Truth and Method. Together, hermeneutics – the theory of interpretation in the most general sense – and phenomenology constitute the main concerns of continental philosophy. These concerns tend to require a great deal of systematic thinking to make progress in them, and thus continental philosophy tends to look more often at the "big picture" and to deal more directly with everyday human concerns than does analytic philosophy – though like any stereotype, this generalization admits of many exceptions and should not be read to the letter.
" Eastern philosophy" refers to the broad traditions that originated or were popular in India, Persia, China, Japan, and to an extent, the Middle East (which overlaps with Western philosophy due to being the origin of the Abrahamic religions). The origins of Hindu philosophy are to be traced in Vedic deliberations about the universe and Rta ("universal order"), the first of which was the Rig-Veda, composed in the 2nd millennium BC. Other major texts with philosophical implications include the Upanishads, the Bhagavad Gita, and the Brahma Sutra, from circa 1000 BCE to 500 BCE. The Indian epics Mahabharata and Ramayana also cover Indian philosophy in much depth. At about the same time, the shramana schools, including Jainism and Buddhism, also developed. It is notable that the Vedanta schools of Hindu philosophy are still living traditions today. Hinduism has no known founder or single, authoritative text . Hindu philosophy is traditionally seen through the prism of six different systems (called darshanas in Sanskrit). The six major Astika schools of thought are the Samkhya ( enumeration), Yoga (union), Nyaya (logic), Vaisheshika ( atomism), Mimamsa (investigation), and Vedanta (culmination of the Vedas) schools. The Vedanta school is further divided into six sub-schools: Advaita ( monism/ nondualism), VisishtAdvaita (monism of the qualified whole), Dvaita ( dualism), Dvaitadvaita (dualism-nondualism), Suddhadvaita, and Achintya Bheda Abheda schools. The teachings of Zarathushtra (Zoroaster) appeared in Persia at some point during the period between 1000-588 BCE. His wisdom became the basis of the religion Zoroastrianism, and generally influenced the development of the Iranian branch of Indo-Iranian philosophy. Zarathushtra was the first who treated the problem of evil in philosophical terms. He is also believed to be one of the oldest monotheists in the history of religion. He espoused an ethical philosophy based on the primacy of good thoughts (humata), good words (hukhata), and good deeds (hvarshatra). In 2005, the Oxford Dictionary of Philosophy ranked Zarathushtra number two in the chronology of philosophical events. Zarathushtra's impact lingers today due in part to the system of rational ethics he founded called Mazda-Yasna. The word Mazda-Yasna is avestan and is translated as "Worship of Wisdom" in English. The Greeks later used a similar word to the Iranian one – the word "philosophy" in Greek literally means "love of wisdom". Manicheism, founded by Mani, was influential from North Africa in the West, to China in the East. Its influence subtly continues in Western Christian thought via Saint Augustine of Hippo, who converted to Christianity from Manichaeism, which he passionately denounced in his writings, and whose writings continue to be influential among Catholic, Protestant, and Orthodox theologians. An important principle of Manicheism was its dualistic cosmology/ theology, which it shared with Mazdakism, a philosophy founded by Mazdak. Under this dualism, there were two original principles of the universe: Light, the good one; and Darkness, the evil one. These two had been mixed by a cosmic accident, and man's role in this life was through good conduct to release the parts of himself that belonged to Light. Mani saw the mixture of good and bad as a cosmic tragedy, while Mazdak viewed this in a more neutral, even optimistic way. In China, the Tao Te Ching (Dào dé jīng, in pinyin romanisation) of Lao Tzu (Lǎo zǐ) and the Analects of Confucius (Kǒng fū zǐ; sometimes called Master Kong) both appeared around 600 BCE, about the time that the Greek pre-Socratics were writing. Of all the Chinese philosophies, however, it is quite safe to say Confucianism has had the greatest impact throughout East Asia. 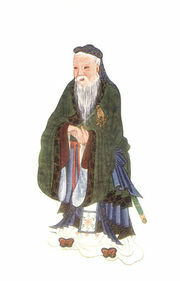 Confucianism represents the collected teachings of the Chinese sage Confucius, who lived from 551 to 479 BCE. His philosophy focused in the fields of ethics and politics, emphasizing personal and governmental morality, correctness of social relationships, justice, traditionalism, and sincerity. Confucianism, along with Legalism, is responsible for creating the world’s first meritocracy, which holds that one's status should be determined by ability instead of ancestry, wealth, or friendships. It is arguable that Confucianism is most responsible for shaping the Chinese culture and state of China. During the Industrial and Modern Ages, Chinese philosophy had also began to integrate concepts of Western philosophy, as steps toward modernization. By the time of the Xinhai Revolution in 1911, there were many calls, such as the May Fourth Movement, to completely abolish the old imperial institutions and practices of China. There have been attempts to incorporate democracy, republicanism, and industrialism into Chinese philosophy, notably by Sun Yat-Sen (Sūn yì xiān, in one Mandarin form of the name) at the beginning of the 20th century. Mao Tse-Tung (Máo zé dōng) added Marxism, Stalinism, and other communist thought. The current government of the People's Republic of China is trying to encourage a form of market socialism. Although, officially, the Communist Party of China does not encourage, and have even forbid, some of the philosophical practices of Imperial China, the influences of past are still deeply ingrained in the Chinese culture. As in Japan, philosophy in China has become a melting pot of ideas. It accepts new concepts, while attempting also to accord old beliefs their due. Chinese philosophy has spread around the world in forms such as the so-called New Confucianism and New Age ideas (see for example Chinese traditional medicine). Many in the academic community of the West remain skeptical, and only a few assimilate Chinese philosophy into their own research, whether scientific or philosophical. However, it still carries profound influence amongst the people of East Asia, and even Southeast Asia. Other philosophical traditions, such as African philosophy, are rarely considered by foreign academia. Since emphasis is mainly placed on western philosophy as a reference point, the study, preservation and dissemination of valuable, but lesser known, non-Western philosophical works face many obstacles. Key African philosophers include the Fulani Uthman Dan Fodio, founder of the Sokoto Caliphate of Northern Nigeria and Umar Tall of Senegal; both were prolific Islamic scholars. The Kebra Negast contains not only a source of the Kings of Ethiopia but a window into African philosophy, as the text undergirds the beliefs of Ethiopian Christians and Rastafarians. René Descartes, who is often called the father of modern philosophy, proposed that philosophy should begin with a radical skepticism about the possibility of obtaining reliable knowledge. In 1641, in Meditations on First Philosophy, he used this method of doubt in an attempt to establish what knowledge is most certain. He chose as the foundation of his philosophy the famous statement Cogito ergo sum ("I think, therefore I am"). He then attempted to rebuild a system of knowledge based on this single supposedly indubitable fact. His approach became known as a species of rationalism; it attracted such philosophers as Baruch Spinoza, Gottfried Leibniz, and Christian Wolff. Gottlob Frege and the early Edmund Husserl were interested in the philosophy of mathematics. Husserl's work Philosophy of Arithmatic, inspired by the teachings of Weierstrass, hoped to show that the concept of the cardinal number was the foundation of arithmetic. The prospects for this project dwindled as Husserl entertained more and more doubts in the final chapters of that same work, culminating in the abandonment of the project by the 1890s. Husserl's philosophical change may have been helped along to a modest extent by Frege's critiques of psychologism. Frege's own work, the Begriffsschrift, developed the concepts of modern predicate logic by making use of the notions of the object and the function, and which would provide one alternative to psychologistic accounts of number. Frege, and to a lesser extent, Husserl, influenced the logicians Bertrand Russell and Alfred North Whitehead. After the latters published Principia Mathematica (1910-1913), many philosophers took a renewed interest in the problems of mathematical logic. With this increased interest in mathematical logic came the rise in popularity for the view known as logical positivism and related theories, all of which shared a commitment to the reliability of empirical tests. Philosophers such as Rudolf Carnap and Hans Reichenbach, along with the members of the Vienna Circle in general, considered only verifiable claims to be genuine philosophy; anything that could not be deduced from testable claims was considered mere superstition or dogma. Karl Popper's insistence upon the role of falsification in the philosophy of science was a reaction to the logical positivists. Heidegger expanded the study of phenomenology to elaborate a philosophical hermeneutics. Hermeneutics is a method of interpreting texts by drawing out the meaning of the text in the context it was written in. Heidegger stressed two new elements of philosophical hermeneutics: that the reader brings out the meaning of the text in the present, and that the tools of hermeneutics can be used to interpret more than just texts (e.g. "social text"). Elaborations of philosophical hermeneutics later came from Hans-Georg Gadamer and Paul Ricoeur. Kierkegaard, a Danish philosopher generally considered the "Father of Existentialism", argued that "truth is subjectivity", meaning that what is most important to an existing being are questions dealing with an individual's inner relationship to existence. Objective truths (e.g. mathematical truths) are important, but detached or observational modes of thought can never truly comprehend human experience. Kierkegaard postulated complex ethico-religious philosophical premises, based in part on the three stages on life's way: the aesthetic, the ethical, and the religious. Nietzsche postulated complex aesthetico-philosophical premises, based in part upon the concept of the will to power. Existentialists sometimes view Nietzsche's thought as characteristic of existentialism, due to the manner in which it places high value in individualism and self-creation, or self-defining. Analytic philosophy developed as a reaction against obscure, vague, and neologistic pronouncements by Hegel and his followers. In 1921, Ludwig Wittgenstein published his Tractatus Logico-Philosophicus, which gave a rigidly logical account of linguistic and philosophical issues. At the time, he understood most of the problems of philosophy as mere puzzles of language, which could be solved by clear thought. Years later he would reverse a number of his positions set out in the Tractatus, as revealed by the content of his second major work, Philosophical Investigations (1953). Investigations encouraged the development of "ordinary language philosophy", which was developed by Gilbert Ryle, J. L. Austin, and a few others. The "ordinary language philosophy" thinkers shared a common outlook with many older philosophers ( Jeremy Bentham, Ralph Waldo Emerson, and John Stuart Mill), and it was the philosophical inquiry that characterized English-language philosophy for the second half of the twentieth century. Still, the clarity of meaning was understood to be of ultimate significance. Since then, a plurality of new movements has passed through English-language philosophy. Drawing on the metaphilosophical observation made by Wittgenstein in his second major work, Philosophical Investigations, in which he notes that a good approach to philosophy must itself be based on a careful examination of the meaning of language, a new group of philosophers have adopted a methodological skepticism. This is seen most prominently in the work of W. V. O. Quine and Wilfrid Sellars (but with ideas going back to Auguste Comte and Whitehead). The group's concerns converge on the ideas of naturalism, holism (in opposition to most of what is considered analytic philosophy), instrumentalism, and the denial of Platonic universals. A number of other perspectives have branched out from Wittgenstein's legacy. One of these is the reworking of Arisottelian moral and political philosophy pioneered by G.E.M. Anscombe and Alasdair MacIntyre, although most analytic philosophers currently working do not consider themselves affiliated with any particular school of thought and approach philosophy's problems in a more piecemeal manner than did their predecessors. Many in the Enlightenment were unsatisfied with existing doctrines in political philosophy, which seemed to marginalize or neglect the possibility of a democratic state. One attempt to overturn these doctrines was that of Jean-Jacques Rousseau, who responded to Hobbes by claiming that a human is by nature a kind of " noble savage", and that society and social contracts corrupt this nature. In his Second Treatise on Government John Locke agreed with Hobbes that the nation-state was an efficient tool for raising humanity out of a deplorable state, but argued that the sovereign may become an abominable institution compared to the relatively benign unmodulated state of nature. G.E.M. Anscombe, in an influential paper, "Modern Moral Philosophy" ( 1958), revived virtue ethics, inspired by Aristotle's ethics, as an alternative to what was seen as the entrenched positions of Kantianism and consequentialism. Virtue ethics has since gained some adherence and has been defended by such philosophers as Philippa Foot, Alasdair MacIntyre and Rosalind Hursthouse. What should, and what should not, be counted as philosophy – and who counts as a philosopher – has been heavily debated. Historically, philosophy has been associated with certain subjects. Still, the search continues for a pattern which unites the disparate philosophical activities and interests of those who study those subjects. A handful of candidate explanations can nevertheless be assembled. What constitutes sound philosophical work is sometimes summed up by the term Philosophical method. Also, it is often agreed upon that arguments should try to follow the rules of logic and avoid fallacies. It has also been argued that the scientific method should be followed as closely as the subject-matter allows. If a branch of philosophy at some point fully can start following the norms of the scientific method, it is no longer termed philosophy, but science. Disparaging terms have been created in order to provide examples of non-philosophers and non-philosophy. " Pseudophilosophy" is used to describe those activities which are not associated with a sensible kind of inquiry, and " philosophaster" is a term used to describe those who engage in pseudophilosophy.